Prof. David Coury (Humanistic Studies, German, Global Studies) reports that the first in a series of programs aimed at local students and their families, to help them better understand immigration and global displacement, was well received. The majority of the programs take place at the Neville Public Museum. 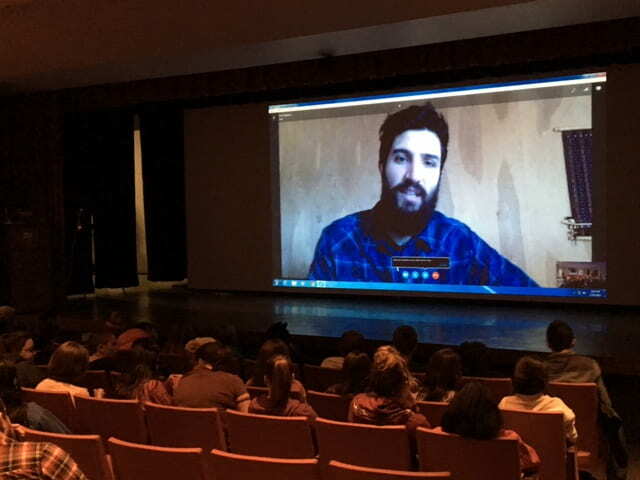 On Feb. 14, 2017 students were able to Skype with Los Angeles filmmaker Zach Ingrasci. Co-directors Ingrasci and Chris Temple spent one month living alongside displaced Syrian and Iraqi families in the Za’atari refugee camp. As the first filmmakers allowed inside a refugee camp, they were able to provide a never before seen look into the world’s most pressing crisis. The film will be shown again at 7 p.m. Feb. 15, 2017 at the Neville Public Museum. The series is sponsored by the Wisconsin Humanities Council, Neville Public Museum, UW-Green Bay and the Green Bay Film Society. For more information, contact David Coury (couryd@uwgb.edu). See the press release. This entry was posted in News and tagged CAHSS, German, Global Studies, Humanistic Studies, Wisconsin Humanities Council on February 14, 2017 by Sue Bodilly.